Regular readers will no doubt have heard of the new SitePoint CSS Reference site that we launched a few weeks ago. We’re pleased to announce that a limited stock of The Ultimate CSS Reference — the hard cover print version of this indispensable reference — is now available! 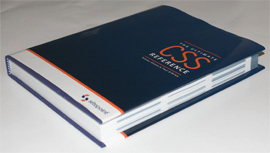 The Ultimate CSS Reference, by Tommy Olsson and Paul O’Brien, is the definitive resource for mastering CSS. In its 440 pages, the entire language is clearly and concisely covered, along with browser compatibility details, working examples, and easy-to-read descriptions. This book’s hard-cover format ensures it will be enjoyed for years come, and the beautiful interior design of the book makes solving your CSS problems a breeze. The Ultimate CSS Reference is a comprehensive resource that you’ll come back to time and time again.